When Jonathan Weiss emailed me two weeks ago announcing that Sharrows placeholders appeared on Motor Avenue, I didn’t think too much of it. After all, stencils marking a place for bike racks have been on the ground next to my Big Blue Bus stop for almost five months. However, apparently LADOT contractors were working overtime again, because yesterday morning Weiss grabbed the above pictures while out on a Sunday morning Constitutional. He was greeted by these views cycling Southbound on Motor Avenue. New Sharrows have already been spotted on Arden Ave., Fountain Avenue, Yucca Street and Vine Street in the Mid-/K-/Downtown areas. If you see more Sharrows on the street, drop us a line and let us know. Redondo Av going N from Washington to Olympic. S Venice BL from where the bike lane ends at Ocean to the parking lot at the beach. There are also some markings to come on New Hampshire between 4th and Rosewood, Rosewood from Heliotrope to Melrose, as well as Heliotrope at the start of the Ciclavia route! Yay! Constitutional? I want my props: I was riding to Covina – or else I would have helped the LADOT workers (not LODOT contractors) with the stencils and gotten some better pictures. I’ve seen the X markers on Veteran, from Pico to the south up to Massachusetts at the north. Unfortunately, I haven’t seen any on Veteran from Ohio to Wilshire. That’s where the street is at its narrowest due to parking on both sides by the apartment buildings and Westwood Recreation Center, and where bicyclists are most vulnerable. I know many like sharrows, but I find them worthless when it comes to a safer riding environment. There hasn’t been any education for motorists nor cyclists. Many don’t know what they mean or how to use them. It hasn’t made any street safer or more comfortable to ride on. I’m on Fountain or 4th Street nearly every week and find neither street ideal for cycling. I prefer bike lanes, but I guess this is the bone we’re getting thrown from LADOT and the mayor. I should clarify–I don’t mean that sharrows will magically make cyclists any less vulnerable on that stretch of road, but at least they’ll make somewhat more clear that bikes have the right to the lane. Would be nice if those sharrows were actually centered in the traffic lane instead of off to the side. Doesn’t sharrow mean shared-lane marking? As in “cyclists may use full lane”? How is it helpful if the sharrow is off to the right side of the road instead of centered in the traffic lane? The ones here in Missoula are right in the middle of the traffic lane, not in the door zone of the street parking (as the one picture above looks like). 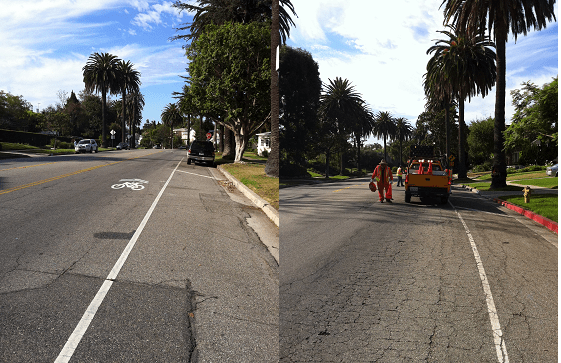 Come on, LADOT, we can use a tape measure but can’t we also actually LOOK at the street and get a complete picture?